Nairobi — Uganda's President Yoweri Museveni, is expected to jet into the country on Wednesday for a two-day State Visit. 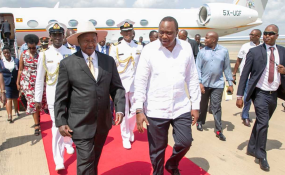 "His Excellency Yoweri Kaguta Museveni, the President of the Republic of Uganda, will be in the Coastal City of Mombasa for a two-day State Visit of Kenya starting Wednesday, 27th March 2019," she said. She stated that thereafter, "the two leaders will proceed to State House, Mombasa, where they will lead bilateral talks with their respective delegations before conducting a joint press briefing."